We are one church lifting up the name of Jesus in two communities. ministry, evangelism, worship, fellowship and discipleship. If you're new to RMLC, and wondering what your next steps might be, click here. If you'd like to find out about our Sunday worship services, click here. Or if you would like to find out about our many ministries, why don't you head over to our ministries page. Rockingham Mandurah Lutheran Church is part of a much bigger body of churches. The Lutheran Church is one of the major Christian churches around the world. It is the largest Protestant church in the world numbering more than seventy million people. In Australia and New Zealand almost 255,000 people call themselves Lutherans. The Lutheran Church dates back to the Reformation of the 16th century, when Martin Luther rediscovered the central teaching of the Bible, namely: Jesus has done everything necessary to reconnect people with God, so that by faith in Christ, we can live full lives of meaning, peace and hope. The Lutheran Church has been in Australia and New Zealand for over 150 years, and today the Lutheran Church is made up of people from both rural and urban areas and many different cultural backgrounds. Click here for more information on the LCA, and what we as Christians of the LCA believe. 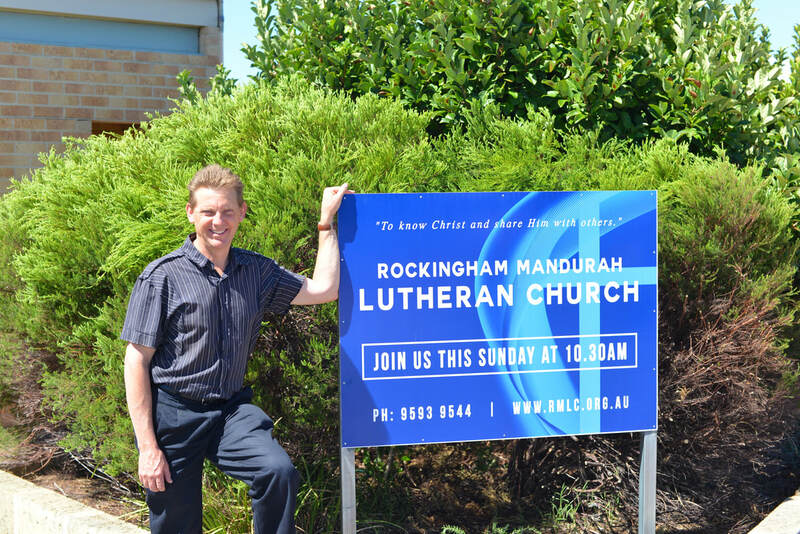 Pastor Steve Liersch moved to the Rockingham Mandurah Lutheran Church in January 2016. He has been a minister in the Lutheran Church of Australia since 1992 beginning in his first parish of Unley in the inner suburbs of Adelaide in January 1993. Steve is now a local with his lovely wife Angelyn and their three children, Sam, Jackson & Keziah. Steve enjoys vegie gardening, although now that he's finishing up his backyard renovation, his focus is beginning to go to other interests like fishing and sport. He still enjoys playing cricket and social tennis when he can, however watching his children play their sport and mixing with other families has always been just as satisfying. Our pastor enjoys bringing the Good News of Jesus and God’s love for all people to both his church and the local community in a variety of ways. Hopefully you’ll get to say g’day to him sometime and share a few minutes in friendly conversation - he’d like that. Rockingham Mandurah Lutheran Church (RMLC) Rockingham site worships onsite at Living Waters Lutheran College and supports its ministry to the students, teachers and families of the school community. Toward the end of 1994 a group of people interested in Christian education, and in particular Lutheran schooling, gathered at St. John’s Lutheran Church in Perth to learn more about the steps to be taken in order to establish a Lutheran school in Western Australia. The chairperson and driving force behind the WA group was Dr. Len Vlahov a committed Christian. Since its beginning the College has grown at a rate that far exceeded expectations. From 63 students who began at Living Waters in January 1997, the student numbers grew strongly every year, reaching 120 in 1998, 340 in 1999, etc. Such growth encouraged the School Board to pursue the request of parents to provide education from kindergarten through to year 12. By the end of 1998 we were granted approval and began work to make this a reality. These days, Living Waters provides education for around 1000 students each year, and we are proud to be an integral part of the communities within the Peel region. ​We believe it is important that all young people develop an understanding of Christian principles and values and strive to use these to form the foundation on which they build their lives. It is our goal at LWLC, through the teaching of a balanced curriculum reinforced with Christian values, that each individual student be given the opportunity to develop their talents and gifts.